My personal philosophy when it comes to anti-viruses is, so long as you follow a few simple rules they shouldn’t be necessary. Most of the big name commercial anti-virus packages are what I call “bloat-ware”. They slow down even the newest computers and in my experience either lull people into a false sense of security or bombard their owners with too many “false positives”. As a result I actually don’t load them on my personal computers as a general rule. My primary computer is a Mac and I browse with Firefox and while this far from makes me bullet proof as some fanboys would exclaim, it does keep a lot of the viruses that target Windows and Internet Explorer users at bay. I also avoid opening email attachments I’m not expecting or clicking links that I don’t trust. 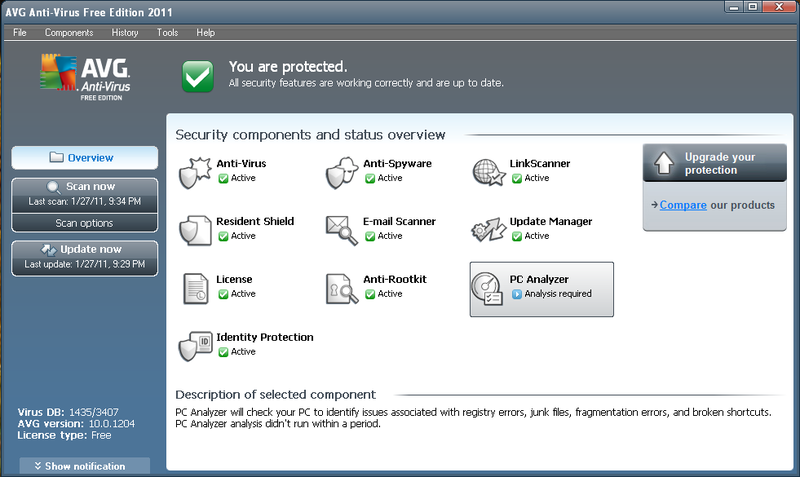 Anti-virus programs are still good tools though and there are situations where I employ them or suggest employing them. People who aren’t as familiar with computers and ways to minimize your risk should definitely put a good anti-virus to use. There are dozens of programs for the PC to chose from though. In this post I will be looking at a program exclusively for the PC. I recommend that you install the product from AVG called AVG Free. I know, I know, a free anti-virus program? Yes. It works and in general it does so as well as the big boys. A recent review on CNet gives it four and a half stars. While it will cause your system to boot up a few seconds slower, it doesn’t impact overall performance in comparison to other similar programs. The thing that impresses me most about their free product is that they use the same scan engine as their paid version. That means that you get the same protection from viruses regardless of the version. They also include a link scanner with the free version. (There is also a version of the link scanner available for the Mac OS.) This product takes a look at links that you might see on sites like Facebook or your favorite search engine and lets you know if they’re safe or not. That’s a lot packed into something free. There are additional features you can get from AVG for a price. Their full package scans downloads before they hit your computer. That’s a feature available from all paid anti-virus software and one that may be useful for some of you. If you do a lot of downloading from sites you don’t trust then it may be worth your money. It also scans links in chat. Perhaps the most valuable tool you receive for the money though is the customer support. If you run into serious problems that you can’t solve, someone from AVG can connect to your computer and help you. If you do choose AVG, there are a few things worth remembering. 1) Update. Update. Update. – It is vital to keep both your scan engine and your anti-virus definition files up to date. How to do this varies from program to program, but make sure it’s happening. Most programs will allow you to set them to check for updates automatically. 2) No single anti-virus will protect you one hundred percent. – If you get a virus and the software you have won’t get rid of it, you may have to use something like the AVG Rescue Disk or Vipre Rescue. 3) An infected computer is typically not the computer’s or the software’s fault. – Nine times out of ten when I’ve had to rescue a computer from the clutches of a serious virus they’ve admitted to downloading something questionable. If you avoid installing things like toolbars for you browser or pirated software you will eliminate many risks. Regardless of what choice you make though, we at the Nifty Tech Blog wish you happy and safe surfing! I would like to see you discuss some advantages/disadvantages to methods used to detect malicious software (namely, signature-based versus heuristics-based, versus a combination of the two). Perhaps it is outside the scope of writing for this blog to do so, but it is helpful to understand HOW various software suites are detecting malware so that we can then attempt to make decisions on WHY they are more effective than others. Does it assume a more tech-savvy audience to discuss that (especially) signature-based antiviruses can be defeated easily with various encodings and they are statistically doomed because of this and the sheer number of variants that are released into the wild by the hour?To be honest, not all AV companies advertise their methods heavily. Perhaps if we started asking them, they'd make that more readily known. Fortunately, there are resources dedicated to seeking out this information:http://www.virusbtn.com/vb100/latest_comparative/indexWhile the full report requires a subscription, that particular chart serves as a good additional reference for paid and free solutions, as tested on Windows 7 64-bit. peace. I'm a mac user as well, but forced into using PCs at work, where we use the AVG free edition on all our computers. Having come from previous bloat like Symantic at my previous job, and watching my mother-in-law struggle with the false positives of Trend Micros's AV software, i find AVG to be unobtrusive and so far, quite thorough. But I agree that knowing a little bit about behaviors that can lead you down the dark path is the best preventative. And when you make the inevitable mistake or bad judgment, it's good to have something like AVG watching your back. I love AVG. Very small footprint compared to Norton or McAfee, very reliable service, the scans don't bog down your OS… what's not to love? @ Jon – I think getting that technical may well be beyond the purview of this blogger at the very least, if not this blog. Knowing you, when you say "To be honest, not all AV companies advertise their methods heavily. Perhaps if we started asking them, they'd make that more readily known." I can whole heartedly agree. I will ponder though investigating what you've brought up and see if I can put together a thoughtful post. @ Richard – Glad you agree! @ Big John – Yeah, user behavior is a HUGE elephant in the room when talking about this. How much does a "responsible" user really need an AV. Of course being responsible doesn't make you immune from mistakes. So it's good to have a backup. @Jim – Agreed. The footprint of AVG (or for that matter Avast and some others) is the best thing about it. Frankly Symantec and the other big boys should be ashamed. I'm a long time Linux user. No anti-virus software, and it hasn't been a problem. I run AVG on my older windows laptop. It scans periodically, and consumes the machine while that happens. My 24×7 linux boxen get nearly 100% of resources 100% of the time for stuff i want. I used AVG years ago, but they had a period of months where the definition updates were failing repeatedly, so I switched. After trying Comodo (way too many alert messages) I switched to Avast and like it.I was driven to a new solution after seeing Norton consuming 60% of the processor when the computer was idle, constantly. This was probably 8-1 years ago on Windows 98 & a 700 Mhz Pentium 3 machine, so perhaps they're better now. With a good selection of free alternatives available, I find no reason to pay to find out. One thing I forgot about AVG that is a bit of a bummer to me: the little green star with a check mark on your search results. I'm not a big fan of unsolicited mouseover popups, and these things just bug the bejeezus out of me. As of yet, I've not figured out a way to disable this malfunctionality. AVG Antivirus is also one of the best apps in Android. Catches all viruses and very easy to use and install. The are no problem when it comes to updating the software. I’m not really surprised, given what a good job they have done with Windows. Have you been using the AVG Mobile for a while on your Android device? Would you like to submit a guest review? We’d love to have a chance to share it with our readers. Can we use AVG together with other anti virus software? thanks for posting the article…. Next post: Happy Birthday, Nifty Tech Blog!